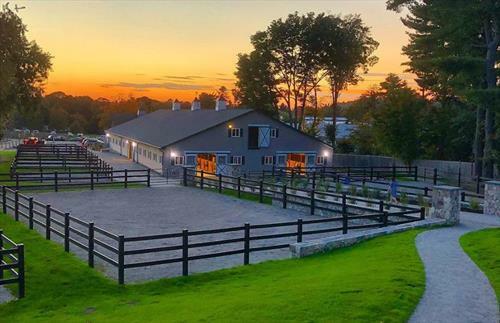 About: Dana Hall Riding Center is currently seeking a part time barn staff to join their team in Wellesley, MA. The barn provides lessons year-round and maintains a busy show schedule under the supervision of Director Sarah Summers and Olympic Silver Medalist Greg Best. This is an outstanding opportunity to join the team at a top equestrian center. Ideal candidates will be hard-working team players with previous horse experience. This is an excellent chance to work with a great group of equestrian professionals at an exceptional facility. Previous horse experience Must pass background check and fingerprint scan Must be willing to work at least one weekend day. Since the 1930s, Dana Hall has offered a comprehensive riding program. Located right on campus, the Karen Stives '68 Equestrian Center offers complete stable facilities and classes ranging from beginner to advanced with instruction to suit every level of rider. We emphasize confidence, safety and control at every level. Dana Hall Riding Center is lead by head trainer Olympic silver medalist Greg Best and Director Sarah Summers. Best is most well known for his partnership with the gray American Thoroughbred show jumper Gem Twist. Together the duo earned individual and team silver medals at the 1988 Seoul Olympics and placed fourth at the 1990 World Equestrian Games in Stockholm.